Along with Sword-of-Grayskull, I was also at Wizard World Philadelphia. I asked the Horsemen how hard it will be to sculpt a new Ram Man figure. Cornboy said that it will not be a challange it's Mattel giving the money for a whole new tooling that can not be reused. Here's what is shown in the slide, from left to right. The Four Horsemen could do a great NA He-man. Tytus and Megator would be awesome! I wouldn't expect them to be the same scale as the vintage figures (due to the unique tooling costs), but I'm sure they could use something from DCUC to get us those figures. Is that SHADOW WEAVER in that pic? ... and Lizard Man??? Does this mean they are going to be doing Filmation based characters? 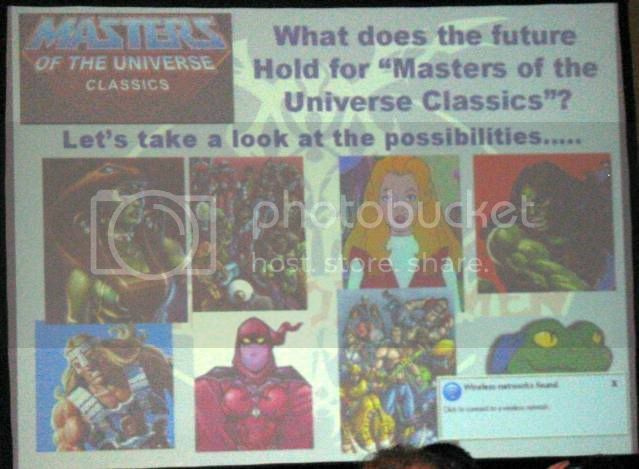 "Let's take a look at the possibilities..."
If it's true, that would be the best news since the start of the MOTUC Line! Could they have gotten the Filmation license and we don't know about it??? Maybe it could be a bombshell they are dropping at SDCC? It's hard for me to imagine them sticking Filmation characters in there without a reason... could it really be happening? I would venture to say "yes". Happy to see that they showed Adora again, just like last year at SDCC. Just released EPISODE 64 - DreamWorks She-Ra reviews of "The Sword" parts 1 & 2 and "Razz"
More Vintage? Oh ye, yes... Good news. if you want to be update to every The Technodrome Redesign Challenge. What is going on?! So happy. Please tell me Octavia is part of the plan too. If they keep showing this version of her every time they do a slideshow presentation vs. using images from the actual POP toy packaging, I'm willing to bet that when Adora comes along she's sporting her Filmation gear. If it weren't a "possibility" then I doubt they'd even bother dangling this carrot in front of everybody's face, at a convention, no less. there may be really good news at the sdcc this year. If they release Shadow Weaver, I will start collecting MOTUC. HOLY COW!!! They're showing Emiliano's Shadow Weaver design! Adora, Lizard Man, Tytus & Megator! NA! ?Green Goddess! WOW!!! Lets' hope they're not just getting our hopes up. My only criticism is that their slideshow needs more POP on it - group shots like the NA pics. who is the top right and bottom left? and if they get filmation rights i want PLUNDAR THE SPOILER!!!! Megator is the top right and Tytus is the bottom left. They're the giants that came out as part of the Powers of Grayskull line in Italy. Top right is Megator. Bottom left is Tytus. Those are the giants. Wow...this is certainly interesting. I'm worried about getting my hopes up, but it would be strange of them to show characters like Lizard Man and Shadow Weaver if there's just straight up no chance of getting them. I wonder what's going on? I'm super excited about NA, btw. Check out my MASTERS OF THE UNIVERSE ART & More at my ART BLOG!!! Jafaristew...the guy that coined the term "200X." tytus and megator the giants of pre-eternia! If they've nabbed some filmation characters, I hope Shokoti and Masque are in there!!! I'm very happy to see GREEN GODDESS of course, alongside Shadow Weaver and Lizard Man. I'm happy for the Filmation fans. While I've said my bits of not really caring for certain things Filmation, I am genuinely happy for the fans. Titus and Megator are going to be AMAZING! It's great to see fanart being used for promotion! They can do that since the legal disclaimer on this site gives Mattel the right to do that. It's doubtful it will be used any further than that. But still great to see! I don't meant to brag, I just think we all did a job good enough and the images we created stuck in people's mind. All times are GMT -4. The time now is 10:21am.